I love to share my extensive gardening knowledge with readers, so that they too can enjoy the wonders of all kinds of verdant plant life. Climbing plants are great for creating screens and smothering ugly garden features or bare walls. Flowering climbers in particular make a really attractive feature in any garden. Colorful flowers attract butterflies, bees and other pollinating insects into your garden, which ensures a more productive vegetable or fruit garden. Easy to care for, these flowers can fill your yard with scent and color all summer long and create the perfect backdrop for your more showier plants. These climbers are best grown over a small trellis, as none of them will grow out of control and cover an area higher than 6–8' high. 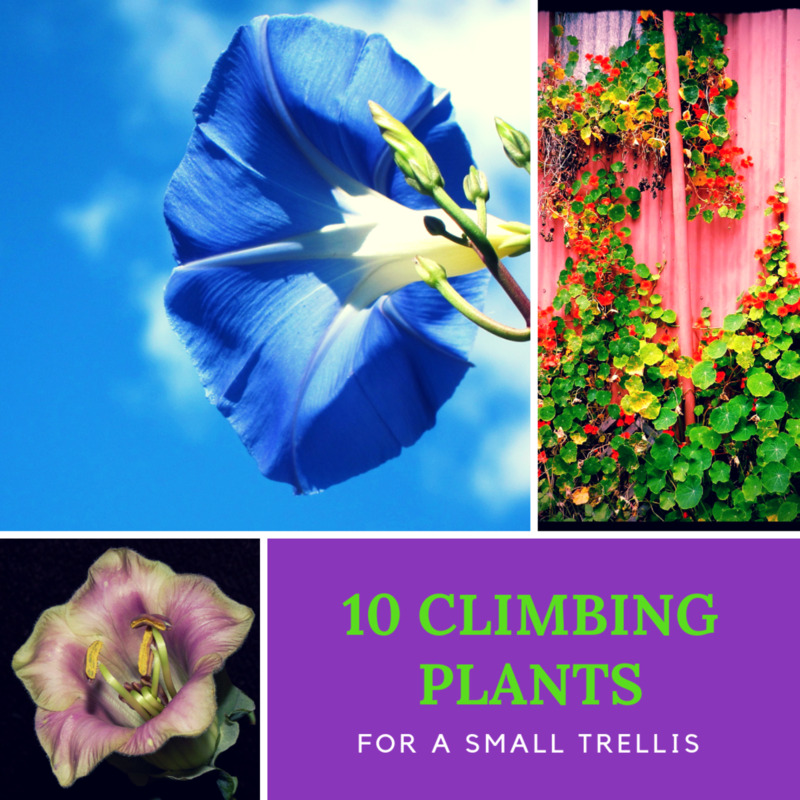 There are such a wide array of climbing plants available, however, that it can sometimes be difficult to choose the perfect climbers for your garden. Here among my own personal favorites are the top 10 best climbers for a small garden trellis—the type you would build yourself or buy ready-made from a garden center. I am especially fond of all types of clematis, and the beautiful pink/lilac hues of 'Josephine' are breathtaking. 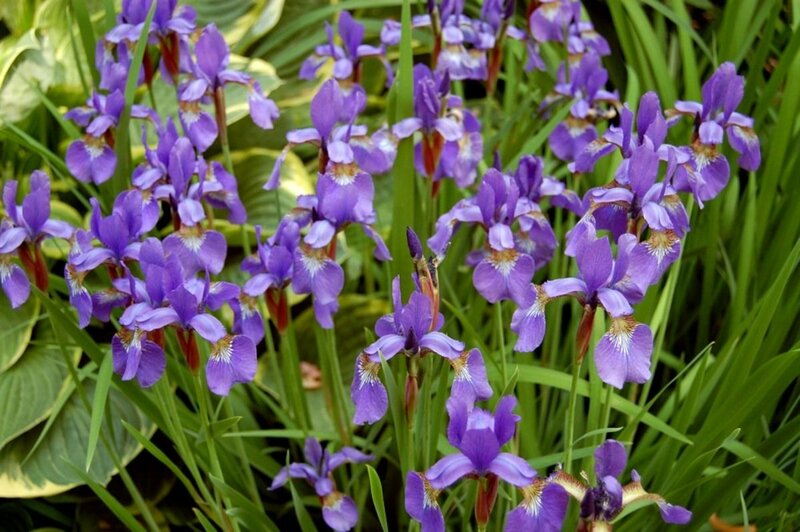 Perfect for the small garden, Josephine is a compact plant that will not grow huge and rambling. 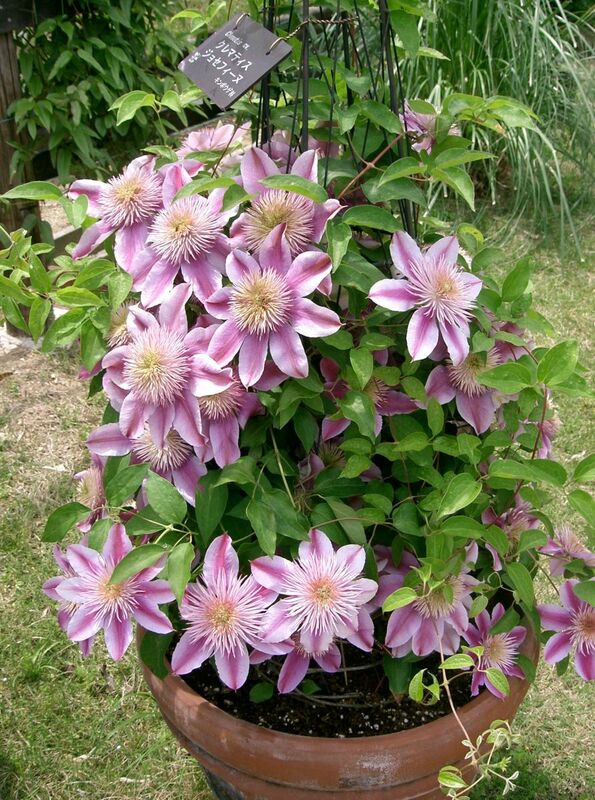 Developed in 1998, you can grow this clematis in a container. It is deciduous and will lose its leaves in the winter, but will return year after year. Position it in a sheltered area that is exposed to at least six hours of sunlight a day. It likes neutral pH soil with good drainage. Plant the crown about 3–4″ below the soil surface to protect dormant buds. 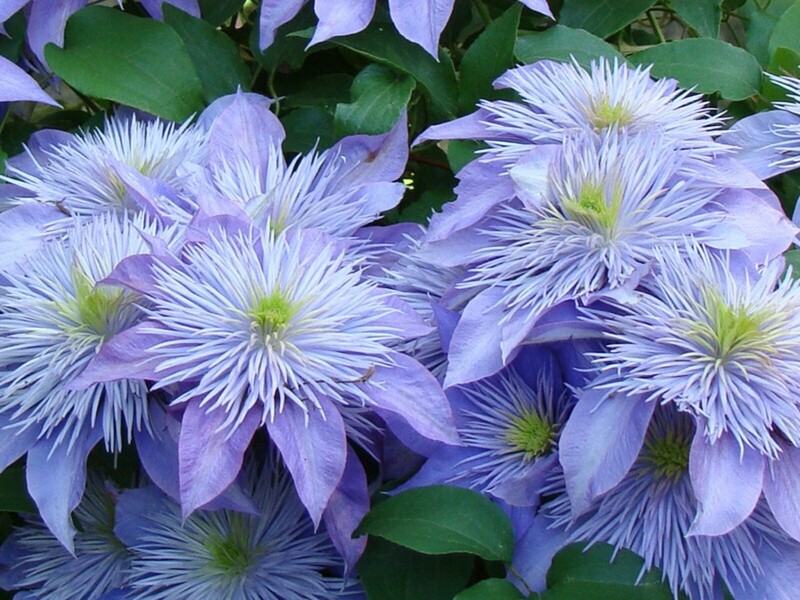 Since it's deep rooted, you'll want to water your clematis thoroughly. It will also need immediate support once it starts growing, otherwise it will become weak and feeble. You can supplement with a low-nitrogen fertilizer in spring, eventually switching to a balanced 10-10-10 fertilizer about every four to six weeks. In late winter/early spring, cut out all deadwood and damaged branches back to the first strongly growing set of leaf buds. Mid-spring is when you can expect to see the strong growth of the new season. This is a good time to cut out excess stems so that you have evenly spaced stems. This will encourage all-over flowers, many of which carry double flower-heads. Also called the 'Flowering Maple' or 'Chinese Lantern', abutilon plants are very vigorous growers and easy to grow. The smaller-flowered varieties can flower all year round, even in winter. 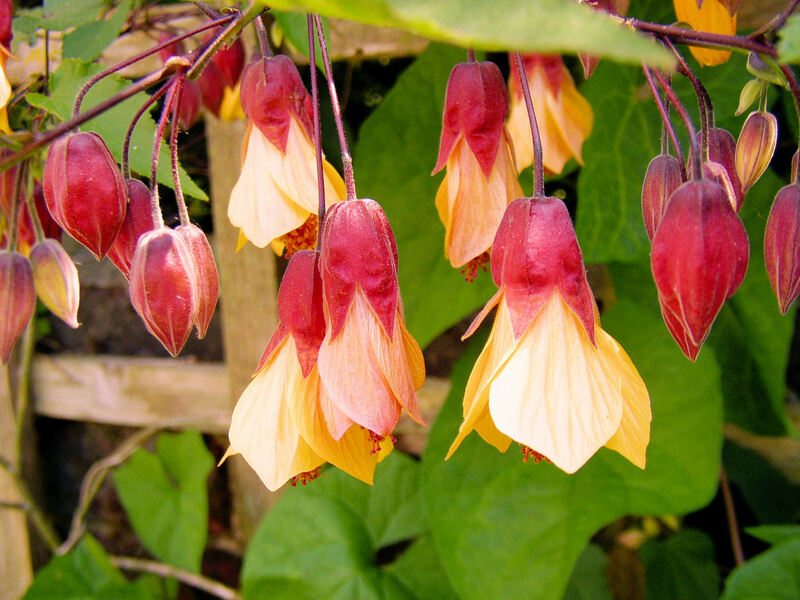 This makes the 'Kentish Belle' cultivar especially attractive, as it is a member of the Abutilon megapotamicum branch of the family, which have the smallest flowers. With attractive red and yellow flowers, the abutilon cannot decide if it is a climber or a standalone shrub. But it is very easy to train up a trellis by tying the stems to the support, which makes for a tidier plant. Great companion plants for abutilons are pale blue flowering shrubs like Ceanothus or Plumbago auriculata. Abutilons are greedy and thrive better when planted directly into a border or very large pot, situated in a place where they can receive regular watering and feed easily, especially if grown in a container. They can withstand light frost but will become dormant if temperatures fall below 20°F. Winter flowering is only possible if daytime temperatures do not fall below 60°F. They can be planted anywhere in the garden that offers sunshine or light shade, but do best protected from the strongest winds. Once your abutilons begin to look a little yellow, start regular feeding or add a slow-release fertilizer (such as those used for tomatoes). Tie it to a warm wall or trellis when you can to help support it and train it where to grow. Water regularly. This plant can be ruthlessly pruned to keep it under control. You can chop it all off right down to ground level, and it will come bouncing back with loads of new growth. I'm a great fan of nasturtiums, and the cultivar 'Flame Thrower' looks like a winner. As anyone who has ever grown nasturtiums knows, they readily set seed and can even become a garden nuisance with their seedlings sprouting up everywhere. Not so with Flame Thrower, as the seeds are sterile. 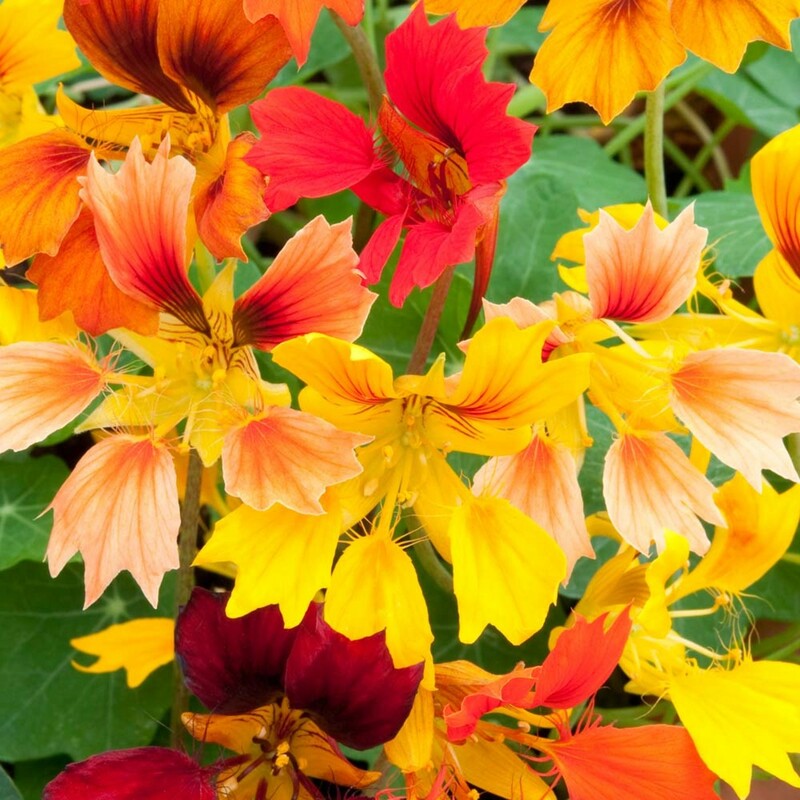 Half-hardy annuals, this nasturtium can climb, trail or otherwise spread, and are covered with the most delicious yellow, cream, scarlet and orange split-petal flowers. This gives it an attractive ragged look. They are fragrant, which is unusual for nasturtiums. Also, their ivy-shaped leaves are edible. Plant seeds in early spring in moist, well-drained soil, about half an inch deep and 10–12" apart. Nasturtiums can be grown in full sun or partial shade, though the former will ensure better blooms. They will flower all summer long. Unless you have really poor soil, nasturtiums generally don't need fertilizers. Water regularly. Let the soil become a little dry between waterings, but don't let it fully dry out. Pruning back faded or dead flowers will prolong blooming. And if you’re growing the plant in a container, it might need to be trimmed back periodically over the growing season. 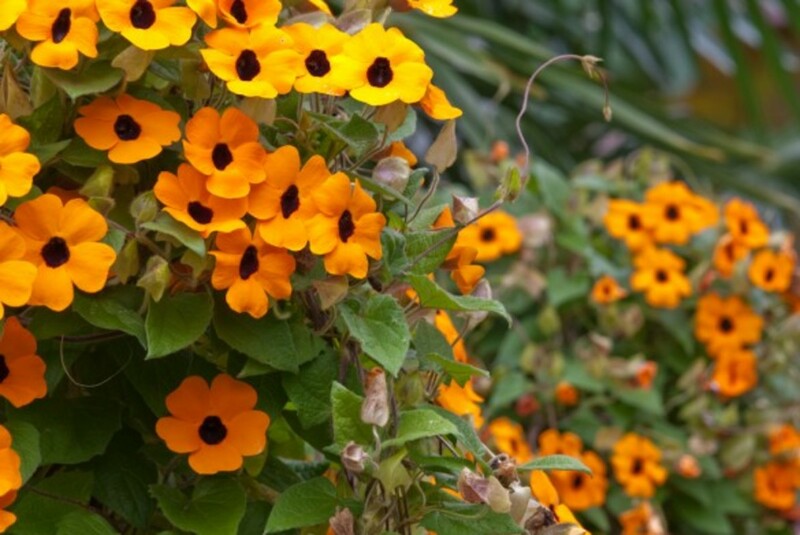 More commonly known as Black-Eyed Susans, thunbergias are very vigorous, fast-growing annual climbers that will quickly scramble over a garden obelisk or trellis, brightening even the gloomiest days up with their profusion of bright, orange-colored flowers. Many Black-Eyed Susans are yellow in color, but 'Superstar' is orange with bigger, and more eye-catching flowers. Grown from seed in the year it is to flower, Thunbergia alata 'Superstar' is indeed a real superstar is anyone's garden. Plant in rich, moist soil with full sun near a support structure, about 14–16” apart. The seeds are best sown under glass in February or March and transplanted into individual pots when they are big enough to handle. Then comes a period of gradual hardening off, before they are planted out into their final growing positions in early summer after the last frost. Black-Eyed Susans grow best with support, so it's best to tie them to a trellis or similar structure once they're tall enough. Water regularly and thoroughly. 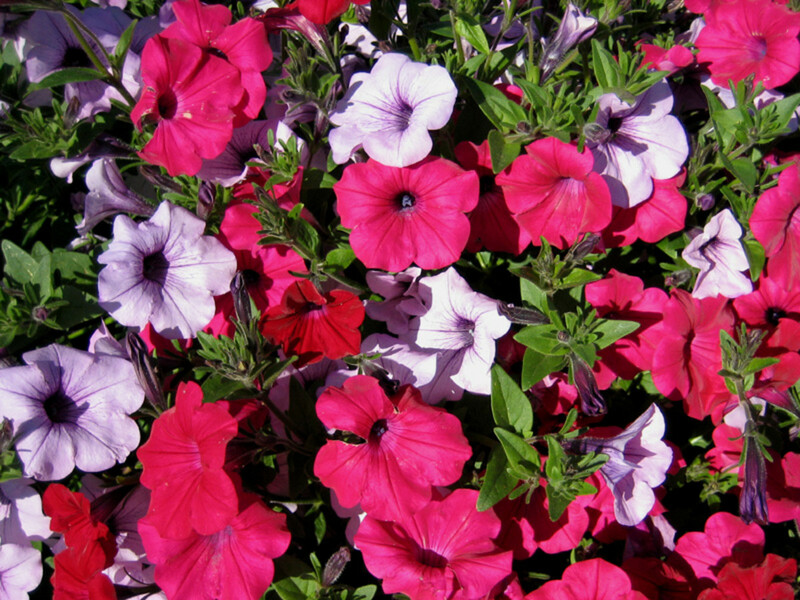 If in a container, fertilize your plant about every two to three weeks when in bloom. Pruning is important to help manage its size and train it to grow up a support structure. Heavy pruning should be carried out early in the spring, before new growth begins. Once the growing season begins, pruning can still be done anytime, but should be kept fairly light. Commonly known as the 'Cup and Saucer' plant, the flowers of Cobaea scandens do indeed resemble something you might drink your tea from, with their bell-shaped purple or cream flowers set on a backdrop of pale green leaves that look like saucers. This half-hardy annual will become perennial if grown in a subtropical climate or if taken indoors during the winter in cooler climates. Grown from seed, these fast-growing plants will quickly scramble over a garden feature or up a trellis during the course of just one summer. Very easy to grow, cobaea scandens produces lush foliage and highly scented flowers, making it a must for gardeners everywhere. Sow seeds in late winter or very early spring in separate small pots (to avoid tangling) in seed compost, covered with perlite or more compost. Carefully harden them off, and plant them outside in full sun near a trellis once all danger of frost has passed. 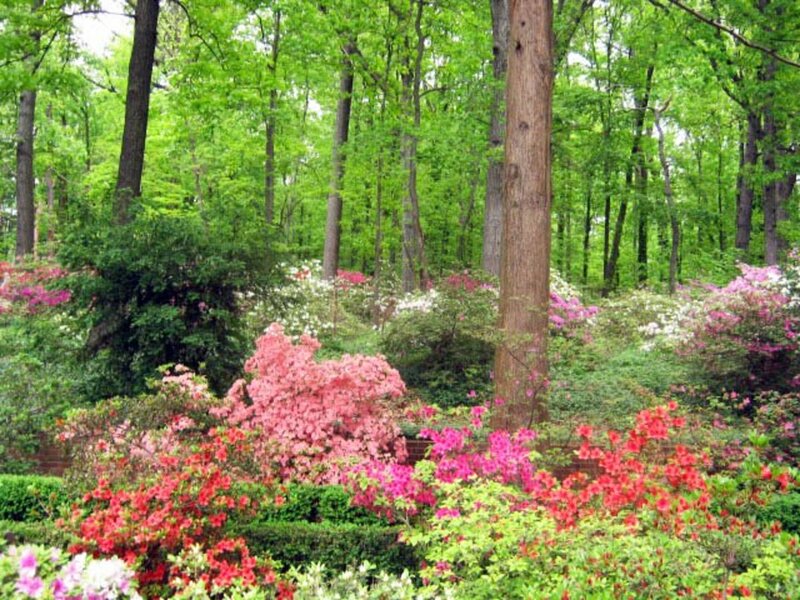 It doesn't need particularly rich soil or much fertilizer, as it will likely be fine with some organic matter. In fact, too much fertilizer will stimulate more vine growth and fewer flowers. Water regularly, especially during dry spells. 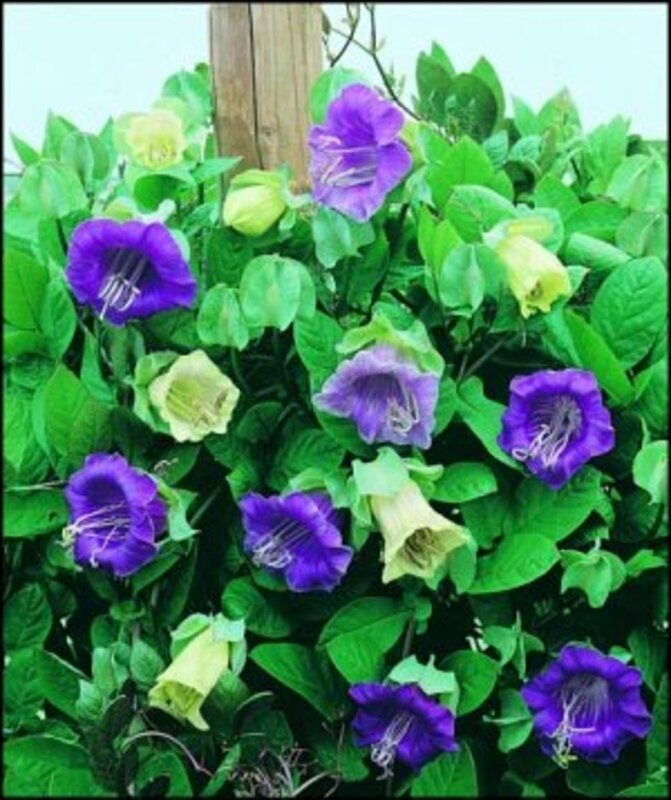 Cobaea scandens can grow quite luxuriously. You can just pinch out the growing tip, however, to encourage side shoots. You can also remove any overhanging leaves you like to make more space for flowers. Commonly known as Morning Glory, ipomoea is a fast-growing vine with large, heart-shaped leaves that is covered in trumpet-shaped flowers all summer long. 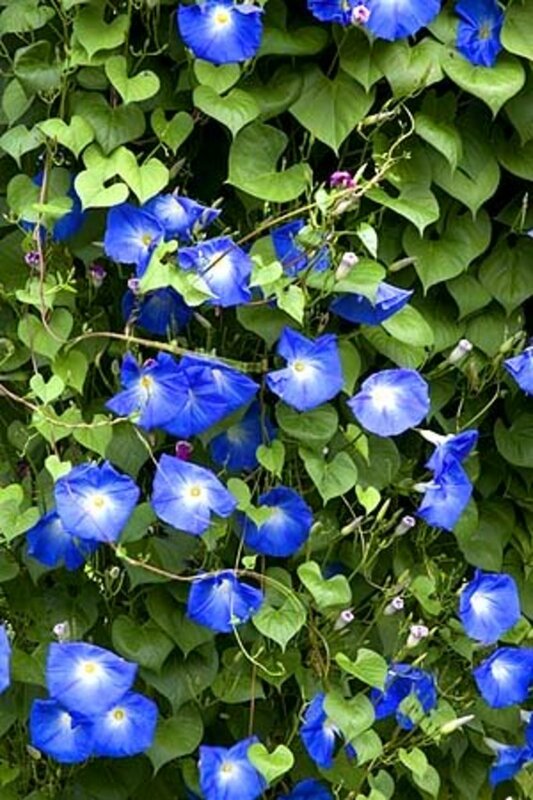 The variety Heavenly Blue is an annual, although some types of ipomoea are perennial. Grown from seed in spring, Morning Glory quickly shoots away onwards and upwards, making it an ideal plant for a small garden trellis. The flowers of Morning Glory always open in the morning, in the direction of the rising sun, and die in the evening, only to be replaced by the profusion of budding flowers already growing on the plant. Ipomoeas are best planted in moist, well-drained soil against a sunny wall or terrace where they are offered heat and protection from wind. Seeds must not be planted, however, until all danger of frost has passed. Space the seedlings about 10 centimeters apart. Lightly firm soil and keep evenly moist. Water regularly. Don't fertilize unless the plant looks nutrient deficient, as too much fertilizer will produce lush vines with few flowers. Deadheading spent flowers will keep it flowering from July until October. If your plant begins to look ragged or stops blooming very well over the course of the summer season, you can revive the vines by cutting them back by up to half. Who could fail to fall in love with sweet peas, with their brightly colored and highly scented flowers that last all summer long? 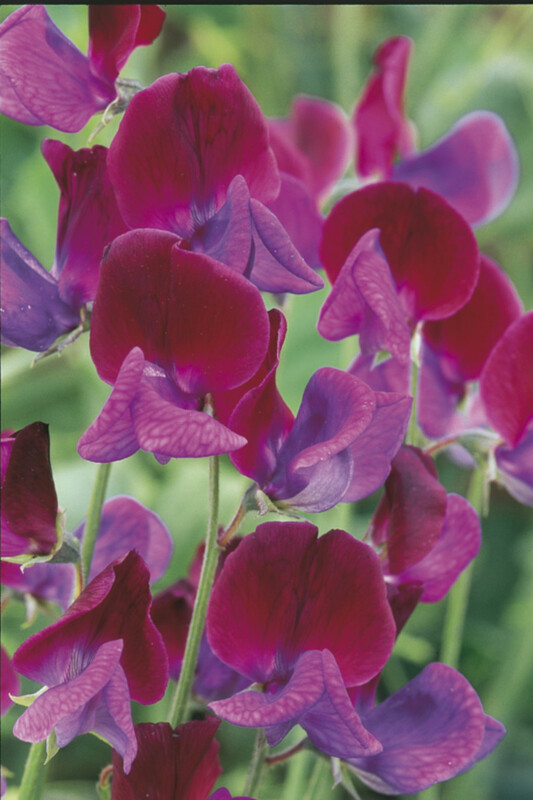 'Cupani' is a variety of sweet pea that is often considered to be the original of the many sweet pea cultivars and is especially scented, with wonderful two-tone hues of purple and violet. Hardy annuals, sweet peas are grown from seed each year and are often sold as plug plants in the spring, ready for planting out. Sweet pea flowers are especially good for cutting for the house, where their scent pervades and intoxicates for weeks on end. No summer garden is complete without the most highly scented sweet pea of all, the Cupani. Plant in early spring in well-drained soil where the sweet peas can get full sun, about 2–3" apart. 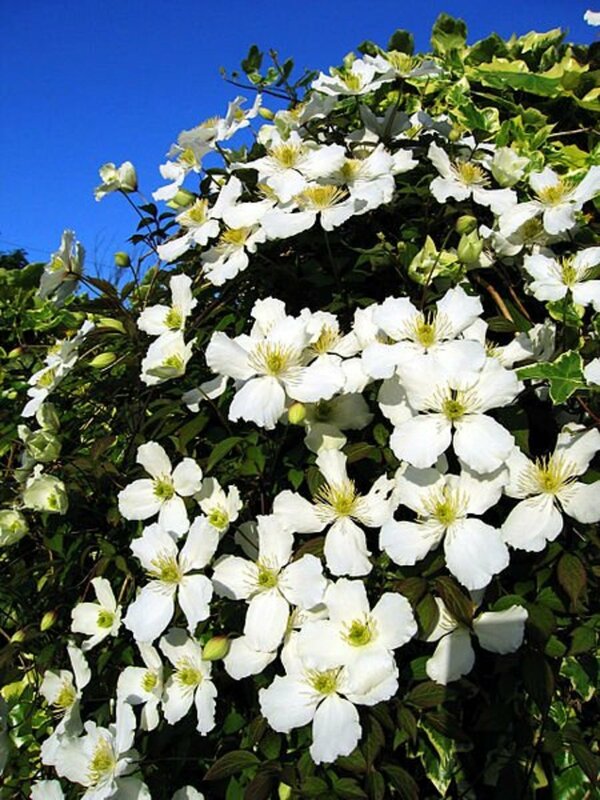 They are climbers with tendrils to support themselves, and so are best planted against a wire trellis, where they will quickly spread out and cover a wide area. Enrich your sweet peas with aged manure or compost before sowing, then apply a balanced liquid fertilizer every two weeks during growing season. Water well (but not overhead), and mulch as vines grow. Pinch off the tops to encourage bushy growth—but wait until the plants reach 6 inches high, or you'll promote side-shoot development. Deadhead spent flowers to encourage new blooms. If you notice minimal flowering after the first flush of bloom, then cut your plant back hard and fertilize. 'Tidal Wave' petunias are simply stunning. These half-hardy annuals grow into bush-like structures that climb or cascade, depending on where they are planted. All summer long, they are covered in the most beautiful pink, purple and white blooms with each one 4" across. Each single plant can grow to 6 feet high, with a spread of 3 feet. This is a must-have plant for any flower garden and would look amazing on a trellis or obelisk as a centre-piece in your yard. 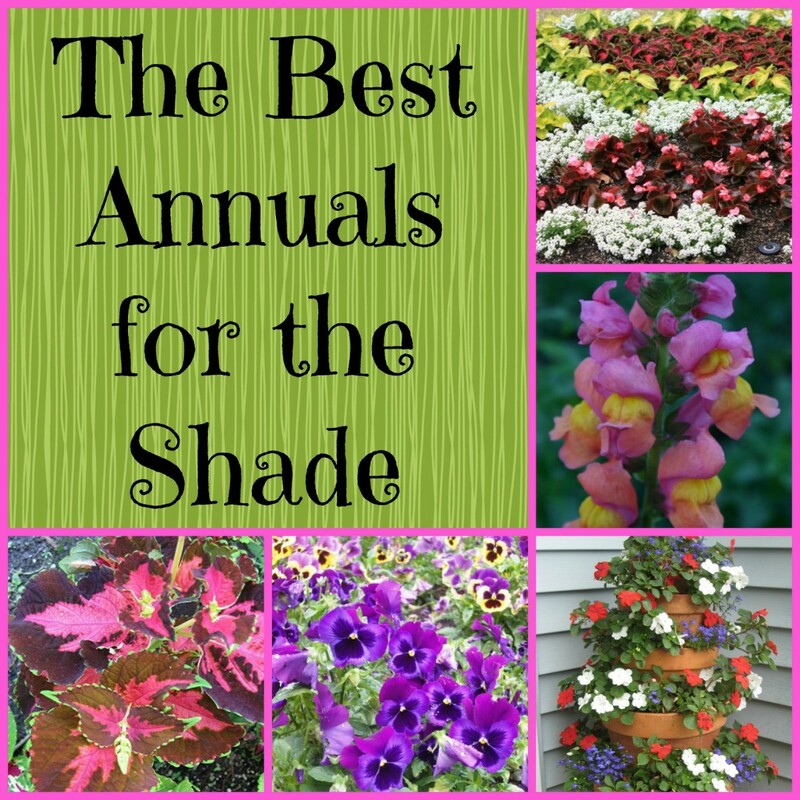 Plant them in full sun in moist, well-drained soil, ideally where they will get at least five hours of sunlight a day. Feed them with an all-purpose, time-released fertilizer immediately. Wave petunias are heavy feeders. Feed them every two weeks (after their initial feeding upon sowing) with a water-soluble fertilizer until the middle of summer. Unlike other petunias that need repeated pinching and deadheading throughout the growing season, Tidal Wave petunias don't. They will continue to grow and bloom without your having to snip one bloom. If the plants start to look a little lackluster, leggy and ragged in midsummer, however, it's OK to cut them back to about half their length. After pruning though, it's important to water and fertilize the plants immediately to encourage new growth. You might think that ornamental gourds are an unusual choice of climber for a garden trellis, but these are fantastic plants for growing quickly to smother an area. And of course, you are left with the most wonderfully attractive fruits of all shapes and sizes. Fast-growing annual climbers, gourds are commonly used as ornaments in both the home and garden. Buy a mixed packet of seeds, and your trellis comes alive with interest as you wait with bated breath to see what shape and color the fruits will take. Gourd vines wander all over the place, but can be easily pruned into shape as they grow. Plant in full sun in well-drained soil that is rich in organic material, at least 4–5' apart. 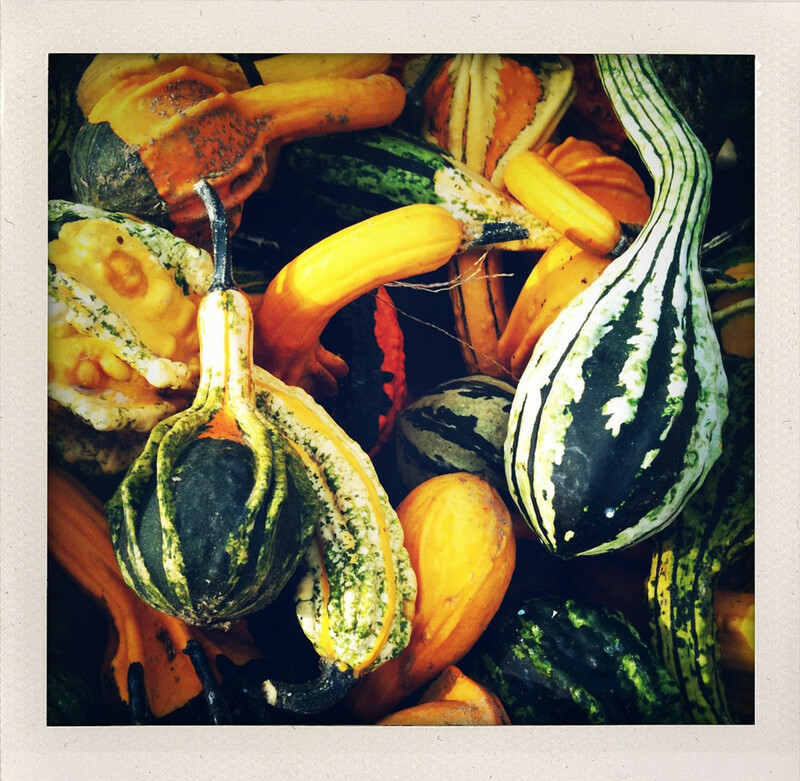 Gourds grow best in hot weather, so consider starting seeds indoors in containers if you live in a more mild climate. Be sure harden them off before transplanting them outdoors, and make sure all danger of frost has passed and the weather is warm. Feed with a balanced 10-10-10 fertilizer every other month. Water regularly, especially during dry or hot spells. To lock in moisture and block out weeds, you can place a layer of mulch down. Once your gourd vine reaches 12–14', pinch the end of that runner off. The vine will then put its energy into laterals. Let each lateral grow to six or eight leaves to ensure you have male flowers throughout the season. You can also prune off some the first fruits to develop on your vines. The plant will replace this fruit with two more. Once the growing season gets more under way, however, you may want to be cautious with your pruning, as the gourds need time to develop and harden off. The Canary Creeper is a member of the same family as nasturtiums and is a wonderful climbing plant to brighten up any dark corner. 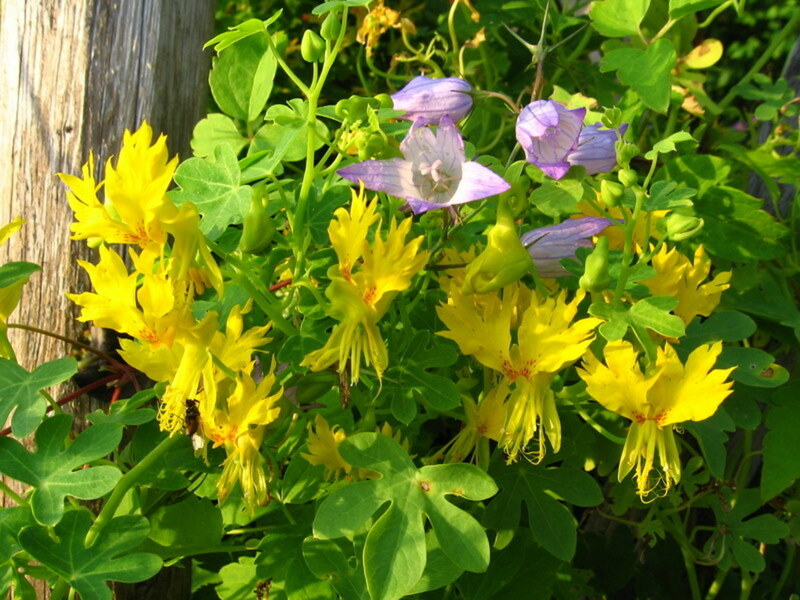 Fast growing, it quickly spreads to cover a whole trellis in bright green leaves, through which the prettiest yellow flowers peek through the foliage. In all but the mildest gardens, it is grown as an annual (as it is frost tender). It also looks particularly good when allowed to scramble through other plants growing on a trellis. Plant in mid-spring in full sun, about a foot apart. It doesn't need particularly rich soil, though it does prefer slightly acidic soil that drains well. A supplement of some organic matter would also help. Since their seeds have hard shells, however, it's probably best to soak them overnight to promote scarification before planting them. It prefers soil that is a little dry and not too rich, so try to water mostly just when the soil almost completely dries out. Go light on the fertilizer—unless the leaves begin to look yellow—as this will produce fewer blooms. Tropaeolum don't actually require any deadheading. Though it can sometimes be a good idea to prune lengthy vines to prevent them from becoming too scraggly. Thank you, beautiful photos and very helpful descriptions. I'm planting a woodland garden, and you've given me some good ideas I hadn't thought of. Thanks for sharing those lovely blooms. I loved the Josephine clementis . Where can I buy it ? Also I lived in zone 3-4 in Calgary. Morning glory is beautiful BUT so invasive. Within a year or two you will regret the choice and after that it will be EVERYWHERE. For your own piece of mind do not use. Love this hub. Very useful and informative with those lovely photos. I wish I had a trellis for my new apartment. Stella doro seeds...since the flower comes from a bulb why do they produce seeds or am I missing something here. Thanks for sharing this very useful and informative hub. Those are all beautiful flowers. Voted this up and useful. Are you sure it is morning glory that is growing rampant in your garden and not its cousin, bindweed? Maybe it depends where you are in the world, but in my climate (USDA 9) I have never had a problem with it . Sorry to hear of your troubles! I'm shocked to see morning glory on this list. Most homeowners I know fight as hard as they can year after year to keep this weed from choking out EVERYTHING in their yards. Fast growing is the understatement of the year! I'm ripping out ten to twenty feet of vines every week. It's beautiful but terribly aggressive, if you must choose to cultivate this weed I suggest you do so in a pot. Your yard will thank you! I love flowers. I enjoyed reading your article on climbing plants. They are beautiful. When they grow. Thank you for the information about the plants. You are fantastic Mr. Gardenexpert999. Your hub is creative. Beautiful.Loved these climbing plants. Thankyou for sharing. That clematis is amazing. Great suggestions on how to make a small garden a paradise filed with flowers! Isn't it funny how some years plants won't grow? Sometimes it is better to start them off late autumn indoors or in a greenhouse for the best summer display. Clematis seem to especially like acid soil, even though they are supposed to grow anywhere. You could try adding some ericaceous soil to a container and grow them there if your soil is alkaline. 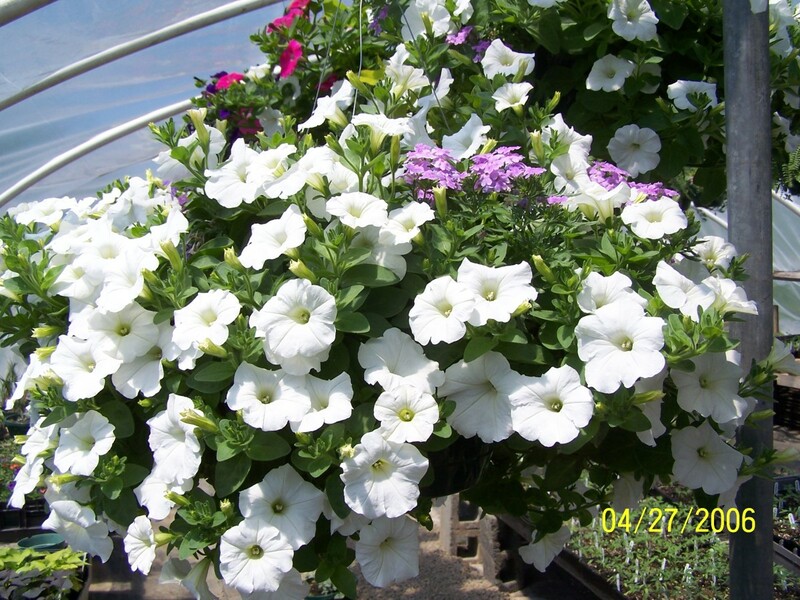 The Tidal Wave petunias are wonderful - you will thoroughly enjoy them! I thoroughly enjoyed this hub! The clematis is just so beautiful, and I have had no luck with it. I have a long expanse of wire fence that I am trying to cover. So far, the decorative gourds are the the only thing growing this year. I hadn't heard of the Tidal Wave petunias. I am definitely going to have some next year. They are awesome! Voting, sharing and more. Beautiful photography as well as flowers - thanks for sharing - pinned. Lovely hub! Have used Tidal Wave as a "crawler" but never as a climber. Great idea. I appreciate your pointing out the link:) Keep the hubs coming! I think you have to find a supplier with plug plants, as the cultivar above must be an F1 hybrid, and is not grown from normal seed. Burpee sell all yellow Flame Thrower seeds which may be a parent of this particular variety. if we knew the other parent, we could cross our own! It is new so maybe not widely available yet. I've put a link to the developers under the nasturtium photo. Excellent HUB! Beautiful photographs of each climber and good explanations of each. I'm partial to morning glories but I'd love to try growing the flame thrower. They embody the colors of fall which is my second favorite season after spring! Voted UP and Beautiful! I am in love with all of them, what wonderful varieties! Thanks for commenting as it allowed me to see that some of this hub was missing after publication (HP experienced a site problem as I was finishing) and so of course I had to rewrite the missing words (as best as I could remember). These are all beautiful climbing plants but the flame thrower is just stunning--thanks for the introduction!